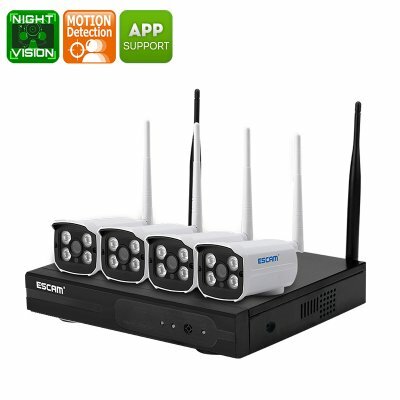 Successfully Added 4 Channel NVR Security Kit ESCAM WNK403 - 4 Wi-Fi IP Cameras, HD Resolutions, Night Vision, Remote Monitoring, App Support to your Shopping Cart. The ESCAM WNK403 NVR Kit is a complete surveillance security package for your home or business. With 4 IP cameras suitable for use indoors or out as well as network video record to capture the footage and remote video playback via your phone, tablet or PC you'll get great peace of mind from this security package. Coming with everything you need for a complete security surveillance solution this channel NVR kit from ESCAM is geta value for money. It comes with four 720P wireless cameras. That is quick and easy to set up. With dual Wi-fi antennas, the NVR offers stable wireless connectivity over longer distances so you have the freedom to place the cameras where they are needed most without needing extensive cabling. The ESCAM 4 Channel NVR and IP Camera Set comes with a 12 months warranty, brought to you by the leader in electronic devices as well as wholesale surveillance kits and security gadgets.